Just finished re-reading “the Doomsday Conspiracy” By Sidney Sheldon, which had me hooked to it so that I lost precious sleep over it after the late night meal. Lol. 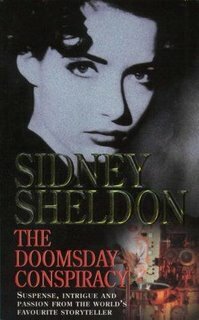 Like any Sidney Sheldon book, this book too is highly readable keeping the readers on the edge at all times. The story was written at a time where U.F.O sightings were becoming a common occurrence throughout the world and where stories of government cover ups were becoming quite the norm. The story centers on such an incident where a U.F.O craft crashes into Switzerland and is witnessed by a busload of tourists. The main character of the book, a trained official of the CIA is given the task of finding all who witnessed this crash on the pretense of “warning” them not to talk about what they have witnessed. The official who is handed over the task has no idea that what they had witnessed had been a U.F.O crash but rather a highly secretive military aircraft of some sort. So thus begins his journey in locating all these witnesses. As soon as he finds them and reports them to his superior, they are killed in mysterious ways, so as not to arouse any suspicion. The story continues with snippets from the past to show to the readers that the hero was so in love with his ex-wife that he hadn’t been “whole” ever since she left him for another man, the reason being that the agent didn’thave any time for “them” anymore. The story does make an interesting read and leads onto a climactic ending that leaves the reader stunned with disbelief. The author ends this book by giving a whole lot of information on the extensive interviews and research that he had carried out before writing the book. It hints of the possibility that such an incident is not so far from being the truth. He further goes onto such “coincidental” deaths of scientists who were involved in the investigation of such actual incidents that had taken place all around the globe. Creepy, is it not?